Do you automatically forward e-mails that come from friends or family? Do it without thinking? Or it’s one of those send this back to me and five others if you’re my friend? Afraid they will get mad? 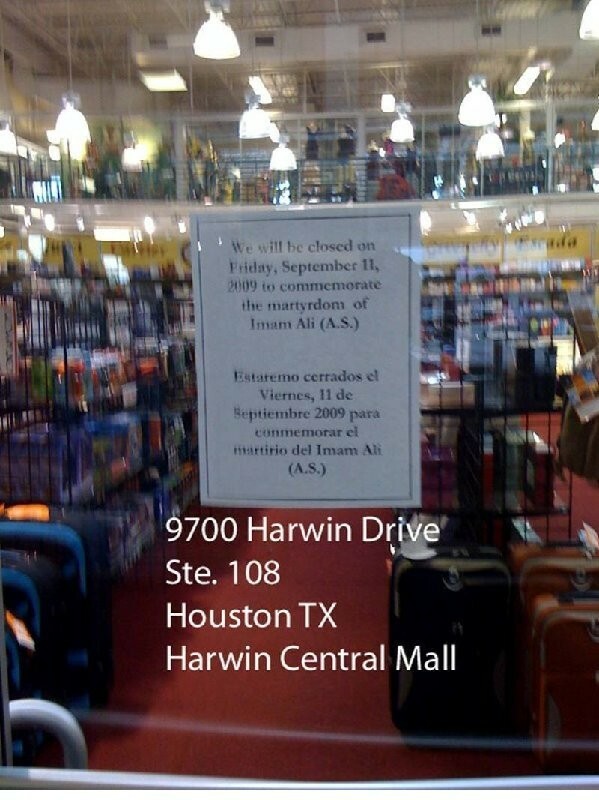 Last September a shop in a mall in Houston, Texas posted this sign in the window and the rage is still roiling. Ramadan follows the ancient lunar calendar. The month-long event has key days that fall on different days on the Gregorian calendar. It is used internationally for most businesses. The sign is shocking … painful to any American who reads it. Sajid Master was appalled when angry shoppers began to scream at him and stomp out of the store. He wants the threatening phone calls and outrageous letters to stop. Anyone who is spreading hatred with calls, letters or e-mails should stop. This only brings dishonor to those who died on 9/11. We have to believe that those Americans want us to foster honor and pride and dignity on their behalf; to restore our country to the great land that it once was; to be an example to the world of true justice. And yes, the store owner should have realized that sign would make Americans uncomfortable on any day of the year and should have worded it differently. This entry was posted in About Us and tagged 9/11, Americans, calendar, e-mail101, mall, problem, rage, Ramadan, shoppers, sign. Bookmark the permalink.